As far as the "live-in" boathouse at 128 Veasey Shore Road, Meredith, it isn't hard to see why this location was selected for her site. 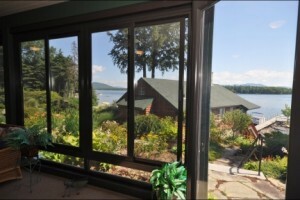 Two reasons readily apparent to the eye, are the spectacular views from this Meredith NH location and the white sand beach that stretches beyond the high water mark, under the crystal clear waterfront, nearly as far as out as the 100 foot long permanent dock and island-like patio. 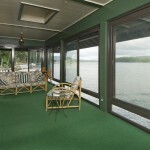 The 30' by 20' patio allows you to enjoy all day sun with water and lake views surrounding you. and comparing it to many other locations around the lake. What are the features of this "live-in" boathouse that make it an irresistible draw? 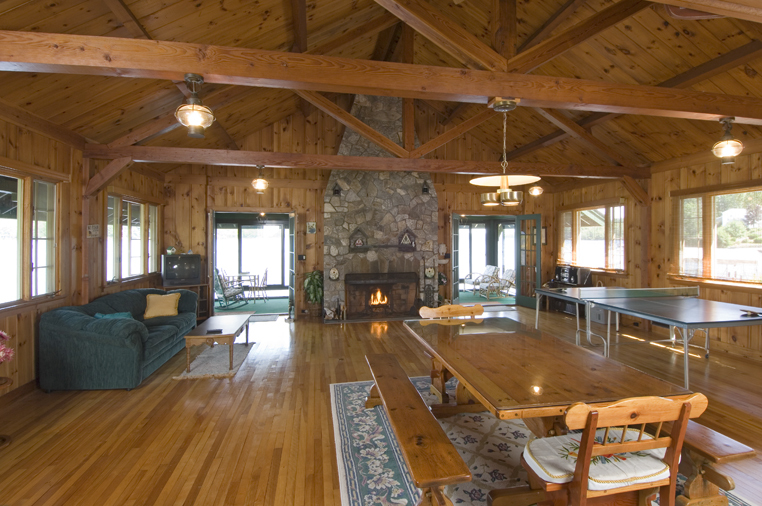 Features including cathedral ceilings, hardwood floors, and large, nearly continuous windows that capture the lake views on three sides come to mind. Because of the easterly exposure and lake location you have 180 degree views on Lake Winnipesaukee, but rarely more than a pleasant easterly breeze at this Veasey Shore location. There are many reasons why people have strong emotional attachments to boathouses. 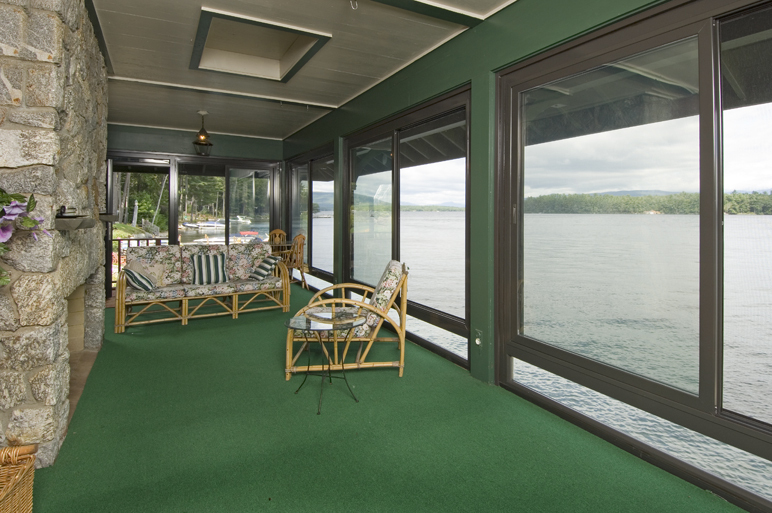 If you spent your formative years on a Lake Winnipesaukee property with a boathouse, you doubtless have your own "Ode to a Boathouse" to write. Magnificent and quaint boathouses can be found as occasional, graceful markers of days gone by, on the Lake Winnipesaukee shores from Winter Harbor to Meredith. Sometimes one can see the antique wood boats for which these boathouses were originally designed, regally resting in the boathouse stalls. 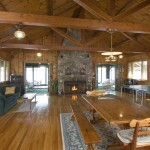 Only once in a great while is a boathouse with both space for a boat and with charming living quarters available on the market. The boathouse at 128 Veasey Shore is one of them and can be seen by appointment, if you are so inclined, as summer winds down, to catch a subtle glimpse of the divine. It's very apparent to me you are a devoted writer, passionate about your subject matter. You write to your readers and not at them. Thank you for making me think.